Click on the blue question below to see the answers appear underneath. Visits booking line: 0191 3323417 Line open Monday 9am-4pm, Tuesday to Saturday 9am-12pm. PLEASE NOTE all visits to HMP Durham today (Wed 14 November 2018) have been cancelled due to unforeseen circumstances which includes issues with the phone lines so if you try to ring you may not be able to get through. Length of visits: Prisoners are entitled to a minimum of 1 hour for a domestic visit. At HMP Durham all visits can be booked either by telephone or email although reception/ first time visits must be booked via telephone. You can call 0191 3323417 to arrange a visit. Anyone who is tagged will need a letter from the Governor before they can visit, which they will need to bring with them on the visit. If booking online, you will receive an automated acknowledgment of your request. Please note this is not confirmation of your booking; you will receive an additional email with confirmation details. You will need to keep this confirmation email and it is a good idea to bring a copy of it with you on your visit. It can take up to 72 working hours to respond to an email, therefore if you need to make a change to a booking quickly please ring the booking line, or allow 5 working days’ notice when sending your request. The booking service is not available on bank holidays. Visits must be booked at least 48 hours in advance to a maximum of 28 days. From Monday 24 September 2018, visitors will no longer be able to make any changes to a visit once it has been booked. Where can I wait when I arrive for my visit? Afternoon visitors at weekends and during the week cannot check in to reception until 12.30pm. You can sit anywhere you like. There is a small café where you can buy drinks and snacks (coins only, notes not accepted). There are toilets, baby changing facilities, disabled access and disabled parking (limited spaces), and a play area for younger children. Children under the age of 18 years are not permitted to remain in the visitors' centre when their parent/guardian are on a visit. Inside the Prison visits area, Nepacs provide a play area and refreshments. You will need £1 for a locker key deposit. Each adult is allowed to take up to £20 on a visit, but this must be in coins. It would be helpful if you bring change with you. Staff and volunteers at the visitor centre are all there to help you. We will do our best to assist you with any question or concern you have, and to provide information and support. Plan your route and check you will arrive in good time for the visit. If you are driving, you will need change for the parking meters (free on Sundays!). The bus and train station are both about a 30 minute walk from the visitors’ centre. There is a limited bus service between the bus station on North Road and the bottom of Old Elvet (5 minutes' walk from the Visitors’ Centre). Ask at the bus station for more details. From the train station, walk down the hill and turn left. Go straight across the roundabout in front of you, into ‘North Road’, which leads into the city centre. Head towards the city centre. Where North Road forks, follow the slip road to the right (near Iceland) into the City Centre. This leads into ‘Silver Street’, a pedestrian area. Head across Framwellgate Bridge and up a slight hill into the Market Place. Turn right at the Market Place, into ‘Saddler Street’ (next to NatWest). Follow this road for a short distance and turn left where the pedestrian walkway leads down a hill (there are some steps at the top of this hill). You will go across Elvet Bridge and there are some traffic lights at the bottom of this hill. Head straight across the road into ‘Old Elvet’. The Royal County Hotel is situated on the left hand side. Follow this road for approx. 1/4 mile. 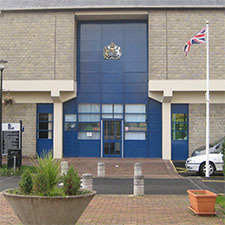 The Visitor centre is located on the left, almost opposite the main entrance to HMP Durham. Parking in the visitor centre is for permit holders only. We would suggest if you can, to park at the top of the hill where it is cheaper. (The visitors’ centre will be on the left hand side of you). There are two spaces available for disabled drivers at the visitors’ centre. In order to use these spaces you will need to advise staff at the reception desk, who will ask you to complete our parking form quoting your car registration number and your disability registration. The blue badge must be placed in the windscreen of your car. Please note, the driver must be the holder of the disabled badge. If you do not register with our staff you may receive a parking ticket. There is a play area available within the visitors’ centre. There is also a play area in the visits’ hall which is staffed by our play workers, who will provide activities for the children during the visit. Please note the play area is not a crèche; parents should watch and be responsible for their children at all times. Please introduce your children to the play worker and let them know which table you are seated at. Children under the age of 18 years are not allowed to remain in the visitors' centre when their parent/guardian attends a visit. Do you run any special family visits? Special father/child visits run every Thursday morning and special family visits take place during school holidays. A family learning visit also takes place on a Friday evening. These are additional to normal visits and are very popular. Ask in the visitors’ centre for details. You will be called, usually by number, when the officers are ready to check your ID and take your photo. Everyone over 10 needs to have ID checked on every visit. Only adults and children over 10 will have their photos taken. Please note that you will have your ID checked each time you visit, so you should always bring it with you! Employers ID card or Student ID card - but only if this clearly shows the name of the visitor and the employer or educational establishment, and has a photograph or signature, and if the employer named on the card is known to exist. For children age 10 and over the following forms of ID are acceptable: birth certificate, passport, child benefit letter or tax credit letter as long as they carry the child’s details. How often am I able to visit? Unconvicted remand prisoners are allowed three visits per week from Sunday to Saturday. These can be booked by you for a time that suits you. Convicted prisoners are issued with one visiting order (VO) every 14 days. Prisoners who have earned enhanced status will be given 2 extra visits per month. These privileged visiting orders (PVOs) are issued on the first of the month after enhancement and cannot be used for weekend visits. They must be booked in the month they are issued. Apart from on the reception visit, you cannot visit unless you are on the prisoner's approved visitor list. Anyone who is on the prisoner’s approved visitor list may book a visit. If you are not on the approved list then you should ask the prisoner to submit your details to the prison - the prisoner will need full name/address/date of birth/relationship. The prison then approves you and adds your details on to the system. Getting added to someone’s visitor list usually takes 7-10 days. This system is designed to give the prisoner some choice and control over who visits him. Please note: children/babies must also be on the approved visitor list before attending. No one aged 17 or under is allowed on a reception visit and a maximum of 3 adults can attend. On a standard visit, there is no limit to children (17 years or under), however for seating purposes in the visit room children may have to stand if there are three adults attending. What can I take into the visit? Each adult is allowed to take up to £20 on a visit, but this must be in coins. No notes are allowed. The money is to buy drinks and snacks in the visits room. You can buy anything you like for the prisoner to eat or drink, but he cannot take anything back to his room at the end of the visit. Before you go up to the visits area you must empty your pockets and put all your property in a locker. The only things you can take with you are your coins and a locker key. If you have anything else with you, you will be sent back, and may miss the visit. You cannot take nappies, tissues and wipes with you to the prison visits room, however Nepacs are able to supply you with what you need. Please ask a member of staff at the tea bar or the play area. Baby milk can be taken over to the prison visits room, however the milk must be in a sealed carton with an empty bottle. Food jars/cartons are not allowed. If you have any prescription medicines that you will need on your visit or any other queries, please talk to the staff in the centre before you go up. All visitors to HMP Durham are subject to searching, which is similar to a domestic airport. Visitors are searched by staff of the same gender, although male visitors can be searched by female staff, unless they request otherwise. Children and babies are also subject to search. If your baby is searched, this will be done by a female officer in front of you. You may be asked to remove their nappy, but a new one will be provided. If your baby is wrapped in a blanket, the blanket will have to be left in the search area. Passive drug dogs are sometimes deployed at Durham: if your child is frightened of dogs you should inform staff. The dogs are friendly and do not bark or jump up. Visitors with religious clothing or headwear are subject to searching. This is done in private by staff of the same gender. You will be given plenty of time to replace your headwear. How will I be searched? You will walk through a portal/scanner then patted down by a member of staff. Coats and jewellery will be checked by hand or machine. Please note, if you need the toilet once you are on the visit, you will have to go through the search process again, however you will also be asked to remove your footwear so your feet are checked and you will be asked to open your mouth. Can I take anything in for the person I am visiting? You can hand in clothes for the prisoner on a reception visit, just after you have your ID checked. Please note: Navy blue and black outer clothing is not permitted (does not include underwear). Nothing should be padded or have a hood. The officers will check through any property you have brought with you and bag it up ready for delivery. You will not give it to the prisoner yourself, but they will usually get it on the same day. Smart court clothes can be handed in on a visit without an application but you must be booked on a visit. Please be aware that this is the only occasion where footwear is permitted. Send Money to a Prisoner digital service. Family and friends are now able to log on to an online electronic system to send money to a prisoner. When you log in you will need to set up a ‘payee’ very much like you would when you do your internet banking. To do this you need the prisoner’s number and date of birth. Once you have input these into the online form and the system has checked this against NOMIS, if the details match, the money will then appear on the prison’s internal spreadsheet (an admin tool) the following morning for approval. The system also gives you an option to pay via a debit card. Once the money has been approved it should appear within 1-3 days in the prisoner’s bank account. By transferring money online it means the money is transferred more quickly, there are less processes and there is no physical handling of money for staff. Durham Prison are still accepting cheques and postal orders. How much money can I send in? Prisoners are allocated £3 a week regardless of their status. They earn extra if they work within the prison. You may send in as much as you like but the amount they can access each week depends on their status. How can I write to or contact the prisoner? You can write to the prisoner, using his name and number. A prisoner will keep the same prison number during his time in prison and will not change, even if he changes prison. If you want to contact a prisoner but are not sure of his number or whereabouts, you can contact the Prisoner Location Service with his name, date of birth, relationship and reason you would like make contact. You can also contact the prisoner using email. Can he phone or write to me? The prisoner is able to telephone his family/friends from his cell, if he has bought phone credit and had your telephone number cleared with security. They are also able to write cards or letters, or send an email (see How can I write to or contact the prisoner? above). Who do I contact if I have concerns about a prisoner? If you have any serious concerns about the person you have visited then you should call the prison switchboard on 0191 3323400, and ask for Safer Custody. All information will be dealt with in the strictest confidence. If you have been pressurised to bring anything illegal into the prison then you can leave a confidential, anonymous, message by calling 0191 3323400 and selecting option 4. Staff and volunteers at the visitor centre are all there to help you. We will do our best to assist you with any question or concern you have. Nothing is too small! If you are on benefits or a low income you may be able to get help with the cost of visiting. Ask a member of staff in the visitor centre for a booklet and claim forms (and keep any petrol receipts or tickets you have from todays travel). 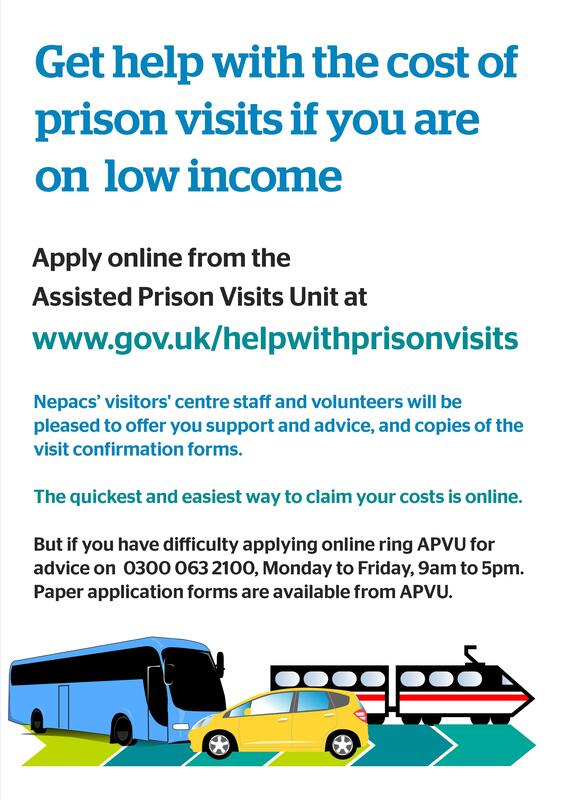 Or you can contact the Assisted Prison Visits for more advice. It is a good idea to fill in a Proof of Visit form to take up on your first visit, just in case you decide to make a claim. For more information about visiting please get in touch with the visitors’ centre on 0191 3323676.